New York - Organic beverage maker Honest Tea says a Donald Trump quote is being removed from its bottle caps, but not because it has any problems with the leading Republican presidential candidate. “I usually don’t think of organic green tea consumers as target demographic for Donald Trump,” said Shapiro, who works for The Humane Society of the U.S.
Later, Honest Tea’s Twitter account responded to Shapiro, “We’re in the process of having his quotes removed from our caps,” with a smiley face at the end. 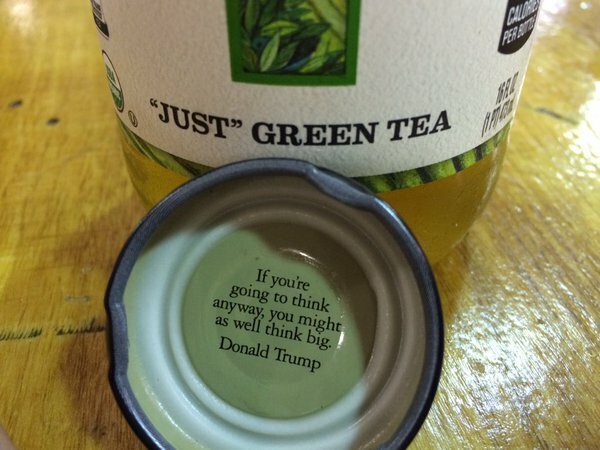 Seth Goldman, co-founder of Honest Tea, said the company had already been in the process of phasing out the Trump quote. When Honest Tea was acquired by Coca-Cola in 2011, Goldman said the world’s biggest beverage maker advised Honest Tea that there was less risk of offending people with quotes from people who have been dead for a while. “There’s nothing objectionable to the thought,” Goldman said of the Trump quote. Surely this will undermine his popularity. Next they'll ban him from Whole Foods and Columbia University.